When it comes to accepting payments and growing your business, everyone naturally wants reliability and quality at the best price point. While the price is important, so are the features you need to run a successful operation. There is a lot of software for restaurants out there, and our team consistently reviews the top systems, and we’ve put together a current updated list of the 26 best POS systems for restaurants of 2019. We’ll also explore what you should be looking for as a restaurant owner or manager when you purchase or upgrade to a new point of sale solution. Efficient and reliable POS software for your restaurant is essential to run a successful business and to be competitive. Purchasing a new restaurant point of sale (POS) system can help you streamline your ordering processes and more effectively manage your business. Your ability to process transactions quickly is critical for ensuring you keep your customers happy. 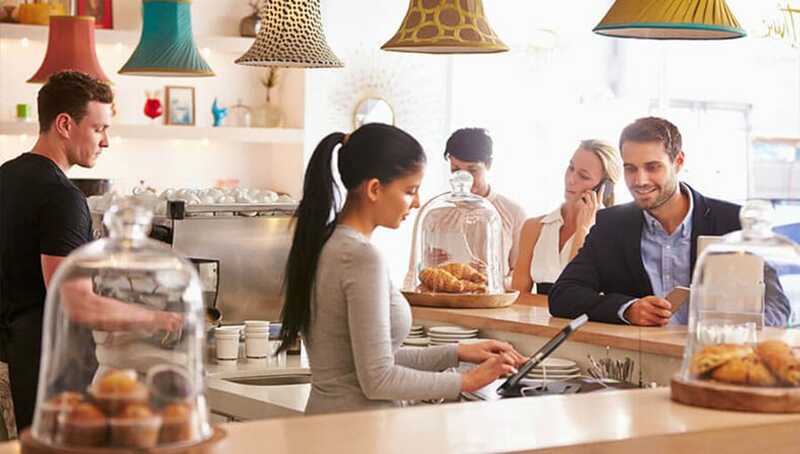 But many modern restaurant owners still operate old restaurant computer systems, point of sale platforms or cash registers that are outdated and in some cases not secure. As you can see, there are many features and options to consider when choosing the best restaurant software for your business. Having the perfect POS system programmed, installed, and with proper training can save you and your staff tons of time when you’re just starting a new restaurant or while managing your existing restaurant. So for that reason, we have put together this list to help find the best company to work with that matches your needs and requirements. The criteria for this list are companies that have proven themselves to be leaders in the market and offer complete products and services specifically for restaurant environments. For a well-rounded and comprehensive list of the best restaurant POS software, we’ve included a summary of traditional, hybrid, and tablet/iPad solutions for your review. Looking for a new POS? Compare price quotes with our free online tool. What are the Best Restaurant POS Systems for 2019? 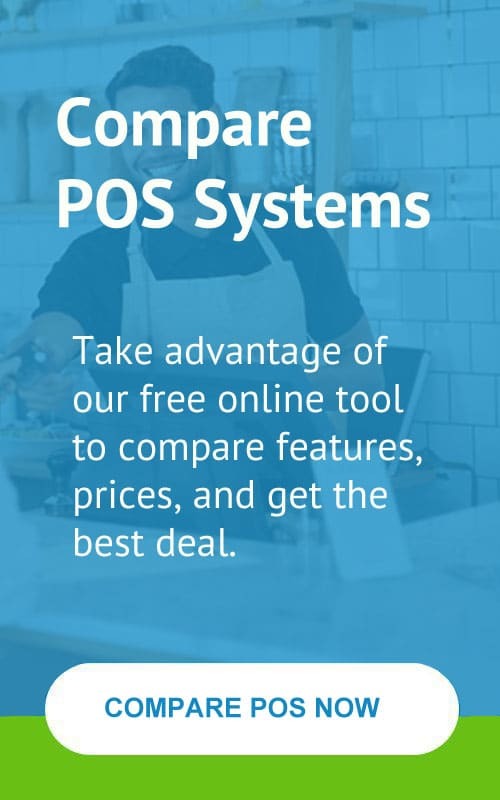 This list of the best POS systems for restaurants of 2019 was curated by point of sale specialists so you can find the perfect POS solution for your business. TouchBistro is one of the leading iPad POS solutions for restaurants currently available on the market today and was one of the original pioneers of tablet-based systems. Widely heralded as the “iPad POS built for restaurant people, by restaurant people,” every feature is designed to meet the unique needs and fast pace of the foodservice industry. In a nutshell, TouchBistro makes running a restaurant easier by streamlining and simplifying all aspects of restaurant management – so restaurateurs have more time to focus on their passion – the reason they opened their business in the first place. Designed to help restaurateurs run a better and more successful business, TouchBistro enables restaurants to make more money, deliver an exceptional guest experience, and take the guesswork out of making business decisions. TouchBistro offers in-depth training and free 24/7 technical support provided by POS specialists who have also worked in the restaurant industry as former managers, servers, and chefs. To book a live demo and get a free quote, simply fill out this quick contact form. TouchBistro has earned the top prize of Best POS System for Restaurants 3 years running by Business Daily News, as well as several other distinctions for their company’s rapid growth and customer support. Their POS solution has also been featured in several episodes of Gordon Ramsay’s new restaurant makeover show “24 Hours to Hell and Back” and was even endorsed by Gordon himself on the show. TouchBistro is available in the USA, Canada, Mexico, and the United Kingdom. Want to learn more? Read our full TouchBistro review here. Rezku POS is a relative newcomer on the iPad POS market based out of Sacramento California. Why we like Rezku – one of the biggest challenges restaurant owners face when implementing a new point of sale system is getting the best service and support required for a smooth transition. Working with a company that puts their customers first can’t be overstated. Rezku is lauded by its end-users and by business analysts for its dependable customer service and their commitment to ease-of-use. That’s a breath of fresh air in an industry dominated by the bottom line. We also like Rezku for the feature set you get included with your subscription. You’ll get a loyalty & rewards program, EMV enabled processing, automated inventory management, customer relationship management, 24/7 support, and new features as they’re available. Rezku is a full restaurant management system with options for guest seating, reservations, online ordering, and waitlist management. Not all cloud-based software offers an offline mode to accept credit cards, but Rezku does this well. Never worry about your internet going down again. At $99 per terminal and $49 for each additional terminal, the subscription cost is on point with the number of features you get making Rezku a definite contender worthy of your consideration. Harbortouch Bar and Restaurant POS is one of the most comprehensive POS systems available to restaurant owners. Harbortouch provides their customers with complete touchscreen terminals and EMV processing equipment at no upfront cost. They also offer free menu programming and free onsite installation to help reduce the cost of purchasing or upgrading your system. The software provides a wide range of additional features – for instance, the new Lighthouse 5 (cloud-based reporting system) includes Jon Taffer’s revenue-generating tactics along with management tools for social media, customer engagement, loyalty, and online reputation management. Not only is Harbortouch one of the most advanced point of sale systems on the market, but it’s also one of the most accessible. You do have to signup with a merchant services agreement with Shift4 Payments to join the program. But if you need a quality solution without breaking the bank, Harbortouch is one of our top picks to consider. Watch Jon Taffer of Bar Rescue endorse Harbortouch. Square for Restaurants is probably one of the most famous and popular POS systems in our list – they’ve done a great job at effectively marketing themselves to small business owners throughout the country. Square’s goal is to simplify the payment processing industry – they handle more complex payment features such as dividing tabs and predetermining tip percentages. The front end interface is no frills, but it is effortless to navigate and find the items you need quickly. Starting at $60 per month, the Square restaurant point of sale can accept payments at 2.6% + 10¢ per tap, dip, or swipe. There’s no need for a separate payments processor. You can use your iPad or purchase a complete Square station. We like that you can remotely access and update your menus, employees, and reports – plus make build changes that work across multiple locations. Also, there is an offline mode; if your internet connection goes down, you can still accept magstripe payments with Square. Get your free 30-day trial of Square for Restaurants. ShopKeep is one of the top-rated iPad POS solutions available for small restaurant environments like deli’s, cafe’s and coffee shops. With inexpensive hardware bundles and reasonable prices for monthly hosting services and no contract commitments, it’s one of the best deals on the market today. If you’re a small restaurant owner that struggles to maintain your inventory correctly, the software allows you to track your product inventory in real-time and integrate your products into their online portal. Get a free ShopKeep quote here. ShopKeep also offers some of the lowest payment processing fees available for small businesses and exceptional customer service. If you’re looking for something priced reasonably, easy-to-use, full-featured, and you want to cut down on processing costs, ShopKeep is a sure bet! Lightspeed Restaurant is a cloud-based iPad POS system from a provider on a mission to help restauranteurs improve business efficiency. The Lightspeed restaurant software is designed for small to medium-sized food establishments. Not only does their integrated software allow for quick and easy data analysis and payment processing, but it’s also user-friendly and can help bring your staff up-to-speed much quicker than other systems. We like that you can insert images and information on products to help your employees improve their customer service and knowledge of your offerings. Employee management and reporting are strong, and their pricing is straightforward and affordable. Future POS provides you with some of the most advanced customization capabilities on the market. Their software is used across both handheld and table-top hardware devices. You can take advantage of ‘multi-column modifiers’ to greater enhance order modifications and requests. Future’s platform also allows for theme and menu customization to help you provide a more user-friendly experience for your staff. The company takes advantage of a cloud storage system which allows you to track and store your data remotely. They are committed to providing as much data and transaction security as possible. Future is a solid option if you need to keep track of multiple locations, especially for restaurants and bars. You can even schedule a demo through their website if you’d like to give their software a try! Upserve POS, formerly Breadcrumb, is a point-of-sale built for the modern full-service restaurant. It’s easy to implement, with personalized onboarding, a dedicated success manager, and professional on-site installation, with 24/7/365 U.S. based in-house support team. It’s easy for your staff, with a training mode, check split, item hold, and more. The product includes features for online ordering, table management, restaurant management, inventory, and customer management. Upserve POS also integrates with dozens of companies like GrubHub, Rezi, and Tock. Revel Systems is an Apple iPad POS software provider that focuses on cross-site capabilities – they make managing multiple stores and locations easier. Data is uploaded in real-time to ensure that you can keep track of your reporting efficiently and effectively. This software platform is also great for business owners that need Quickbooks integration and provide promotions, gift cards, and loyalty schemes for their customers. All of these features are built into the App. Their pricing is based on a monthly subscription fee which is affordable for all the features you get compared to other iPad offerings. They also have Reveal as a Service (Raas) with monthly pricing that includes no upfront cost covering the monthly subscription and hardware. Toast is an Android-based POS system that is designed to provide business owners with modern touch-screen capabilities. Restaurant owners that use Toast can process payments on-the-go and at tables – you can efficiently manage payments and orders without the need for a large computer or central hub. With Toast, you can expect an intuitive and user-friendly interface with exceptional customer service when you need help. There are additional costs for add-ons, and you’ll be locked into Toast merchant services for credit card processing. So you won’t be able to use your credit card processor of choice as some other systems. Cake POS is a software and hardware program offered by Sysco (one of the biggest food and beverage companies). The platform is one of the most advanced on the market. You can use the software to perform transactions quickly, manage guests and tables, and receive online orders. Cake also offers their clients the ability to purchase or lease hardware at affordable prices. They have one of the most attentive customer service teams in the market – you can call their customer care department 24/7 for technical assistance. Their business model operates on a 2.5% transaction costs – there are no additional hidden fees or charges. The system has featured in a variety of top tech publications and websites. SpotOn Restaurants (Formerly Emagine POS) is a trailblazing POS solution that integrates credit card processing with cloud-based restaurant software and SpotOn marketing tools. This particular combination of software and integrated services offered by SpotOn provides tremendous value to business owners. For instance, you can create marketing campaigns to connect with your customers through email, mobile alerts, and social media sites. Also, they have online ordering, pay-at-the-table, and they offer customer review management and integrated loyalty reward programs that SpotOn is very popular with for restaurants. On their website they mention “whether you operate a fine dining restaurant, quick-serve restaurant, bar, nightclub, multi-location chain, or franchise, our point-of-sale solution has all the tools you need to help boost efficiency and engage customers like never before to accelerate profit.” We agree with this assessment considering their product is installed in all the restaurants at several of the busiest airports in the US. Airports are super busy, so providing services at that level is quite the challenge. That’s an accomplishment, to say the least, and equates to software that is feature rich and reliable. Clover Station provides complete POS software and hardware devices to help simplify the process of upgrading your current systems. Clover has additional solutions available like Clover Mini and Clover Mobile designed to align with your specific business environment and needs. The software includes automated reporting of different datasets to help you stay on top of your numbers. However, the system offers pretty basic functionality overall. There are supplemental apps you can purchase from the Clover App Marketplace to provide additional features. You might consider Clover an option for a small to a medium-sized restaurant if you’re looking for a complete and straightforward all-in-one solution at an affordable price. While Clover is easy to set up and use, you will be locked into a merchant account contract with First Data. Loyverse is for you if you can’t afford to spend money on a new restaurant management system. If you think it’s time for an upgrade, but are low on funds, Loyverse is one of the only free POS software programs on the market. Despite being a free service, Loyverse offers their clients plenty of functionality – you can track sales data and other figures to help improve your business operations. Also, you can set up notifications for various purposes – Loyverse can even notify you when your current products are low in stock. There are some costs for additional add-ons, but if you need a “starter” solution, you can’t beat free! Maitre’D offers their clients two different types of platforms – traditional counter-top and tablet-based POS. It’s great if you have a dynamic business that can benefit from multiple forms of payment processing. The platform automatically produces reports on sales data, promotions, revenue, and other integral figures that restaurants require. It’s a feature-rich solution that works in establishments such as fine and casual dining, table service, hotels, quick service, and small restaurants. One of the critical benefits included with Maitre’D is their mobile alert system – it can help you solve incidences quickly from a distance if a problem arises. NCR Silver is an excellent platform to consider for business owners that use multiple hardware devices within their business. NCR Silver is also one of the few POS systems that offer solutions on both Android and iOS devices. NCR Silver can customize your package depending on the size of your business and the number of locations you operate. They’re an excellent choice for a business owner of any caliber or capacity, including muli-locations. NCR Silver Pro Restaurant has added features such as happy hour pricing, floor plan customization, and house accounts that many full-service restaurants, bars, and pubs require. Brew POS is a restaurant and bars POS system that is usable across a variety of different hardware platforms. You can install their software on Windows computers and certain Windows tablets. You can use this platform for counter-service and tableside ordering. Brew POS also offers a delivery mode for business owners that are looking to expand their delivery capabilities. You can use this mode for caller ID recognition, delivery distance, delivery tickets for drivers, and order histories. Many brewpubs and breweries like to use this as their go-to product. POSitouch is one of the most versatile software applications available for the food service industry. The company allows you to choose between table service and on-the-go service options. You can also manage reservations and current seating arrangements through their portal – it’s included in the cost of the service. If you’re looking to purchase a POS system for your restaurant that can help all the components in your business, POSitouch is one of the best options. Restaurant Manager POS, as the name suggests, is a point of sale software system geared explicitly towards restaurant owners. You can use their application on traditional hardware, as well as tablets and the cloud. Restaurant Manager has several customizations that allow you to use the software geared towards your specific industry or restaurant-type. These custom POS platforms include Restaurant POS, Bar POS, Delivery POS, Coffee Shop POS, Pizza POS, and Quick Service POS. The company’s software boasts the ability to be scaled to a restaurant of any size – it doesn’t matter if you’re running a food truck or a 50-table restaurant, Restaurant Manager can handle your business efficiently. Restaurant Manager also has an extensive client base, including restaurants like Relish Gourmet Burgers, La Fonda Latina, Pascal’s Bistro, and Mahoney’s Bar and Grill. Aloha POS is one of the most popular POS systems in the world. This unique software has been used by more restaurant staff than any other software on the market – this can significantly reduce the amount of time it takes to train new staff. While data is stored on your hardware, sales figures and other information is also housed in the cloud, which makes it easy to access relevant information when you need it remotely. NCR, the company that produces Aloha POS, also has other software programs that you can integrate into the system for added functionality. Regarding features, you’ll be able to split checks, keep track of multiple tabs, access tip information, and tip sharing, modify food orders on-the-go, prevent issues and theft with advanced internal controls, and much, much more! Aloha is one of the more expensive options on the market. However, it is prevalent for high volume restaurants and chains. For professional restaurant staff, chances are they’re familiar with the Aloha software, so the good news is your staff will most likely already be familiar with the user-interface and require less training time. Micros Food and Beverage POS Solutions are produced by Oracle – one of the largest commercial software companies in the United States. With Micros POS, you have the security and reputation of one of the most powerful software companies on the planet. Not only do they provide integrated payment systems and mobile reporting information, but they also have a great customer service team that can assist you whenever you need it. Along with Aloha, Micros is one of the biggest point-of-sale companies in the industry working with chains, franchises, and large corporations. Micros boasts an extensive client list that includes IHOP, Hard Rock Café, Cracker Barrel, Sonic, TAO, and plenty of other nationwide restaurants. There are less expensive solutions that are better suited for smaller private restaurants and mom and pops. If you feel you need the corporate touch though, then check out Micros. Aldelo POS is designed with the hospitality industry in mind and works best for restaurants, bars, breweries, nightclubs, quick service, franchises, and pizzerias. Aldelo offers several options for merchants to choose from including the Aldelo Express iPad POS, Aldelo Restaurant POS, and XERA Restaurant POS all for small, medium and large establishments respectively. Their program is compelling with their new business model; they are now offering their software and equipment for free if you sign up for Aldelo Pay (their merchant services). They also include free remote installation and training as well. The credit card processing rates are defined on their website. Nobly POS is an App that provides you with vast levels of customization and control. It’s an affordable solution for someone looking for a service that can stay fast-paced in the small to mid-sized environments. You use the App on iPads, but you can access your back-office information on your phone or computer as well. Their back-office portal allows you to access real-time reports, end-of-day reports, menu editing, loyalty schemes, receipt customization, and more. The platform is cloud-based and has an offline mode to keep your business running smoothly. You can also control your settings and customization remotely through the online portal. AccuPOS is an excellent option if you’re a business owner that already uses QuickBooks or Sage for your business accounting and reporting. AccuPOS integrates with these software programs to automate your reporting and save you loads of time on administrative tasks. You can purchase the software for Android mobile devices, or you set it up on a Windows computer. It’s an excellent option for in-store and on-the-go payment processing. If you’re someone who likes to stay organized, AccuPOS is a solid option. EPOS Now is another POS system that also allows for expanded capabilities, such as timesheet tracking and inputs. If you’re looking to work with a provider that has large, well-known clients, Epos Now could be one of your best options. They’re trusted by large chains and hospitality companies around the country. You can also use their services to receive real-time updates and tracking from your various devices. eZee BurrP! We know, it’s a funny name and they could have done a better job naming the product. But it’s another great POS system for business owners that need to manage multiple locations or outlets. It’s a more traditional Windows-based solution suitable for restaurants, bars, nightclubs, quick service, and delivery. You can access all your POS systems from a central location to keep tabs on sales and revenue figures. This platform makes it much easier for managers and owners that need immediate access to separate sites. You can also keep tabs on your inventory through their automated inventory tracking system – it will manage your stock in real time. As you can see, you have plenty of great companies to choose from if you decide to upgrade or purchase a new point of sale. Obtaining a new restaurant management system is an investment in your business efficiency. Having the ability to properly manage your orders and staff can do wonders for your customer service. It also dramatically reduces the chance that mistakes occur in the workplace. Automated reporting will give you greater control of your finances and significantly reduce the amount of time you spend on administrative tasks in the workplace. Coming soon, we’ll have individual reviews and rankings for each of the software programs above to help provide more information. The bottom line – there are many options to consider when choosing the best restaurant POS system, so think carefully about the features and functions you require, at a price point that is affordable for your business. By choosing the best option for YOU, you and your staff can focus on the components of your business that matter most, like making money! Compare with our free online tool. Editor’s note: Did your company make the list? Get your POS Award here. Please share your comments below on how we did with the list. Does your company deserve to be on our list? Please let us know why below or contact us, and we’ll evaluate your software for inclusion.